So, once again, we’ve made it to the holiday season! Happy Holidays! 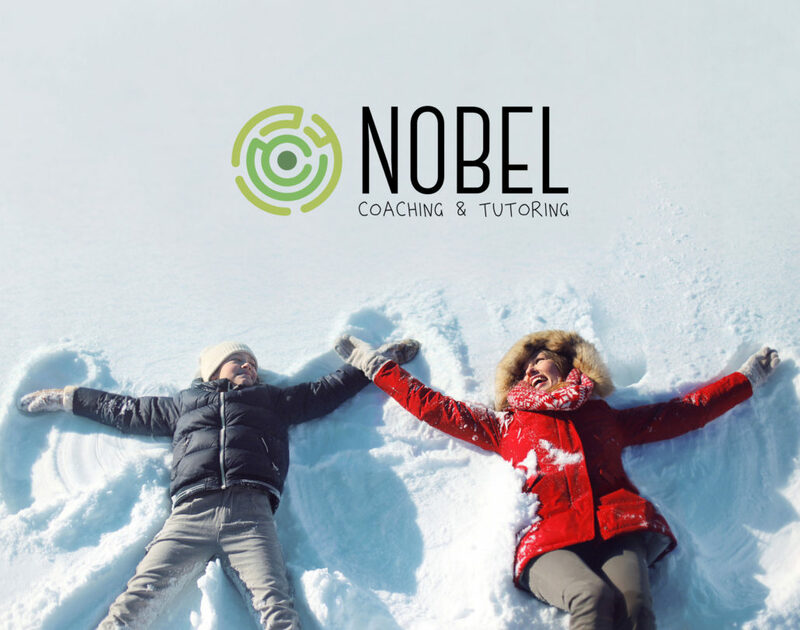 There are so many reasons to embrace and cherish the holidays, but, first and foremost, the holidays are a perfect time for families to spend quality time together. Many of you probably have your own family rituals such as decorating the Christmas tree and your home, making gifts and holiday cards together, dining together, making a snowman, creating resolutions for the new year, and maybe even starting a small snowball fight. Whatever the tradition, the holidays are a time for togetherness. In this article, we will share some ideas related to creative joint activities that you can do at home that you can add to your family traditions. There’s no need to point out how activities performed as a family are paramount in strengthening the bonds within families and for nurturing healthy relationships. Some activities that we suggest here are suitable for toddlers and younger children; others are very good for teenagers. You, as parents, can easily participate in all of them. We recommend that you and your family review the activities and select the ones most appealing to you so that nobody feels forced to participate. We created this list to inspire you. We hope that, in reviewing it, you’ll come up with even more ideas. The Christmas tree in your home is a great motivator to use when planning activities with your preschooler or toddler. 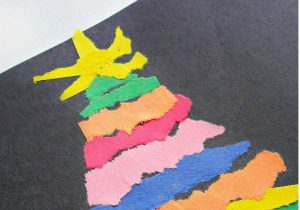 Using your Christmas tree, you can employ simple techniques to develop your child’s imagination and motor skills. For this activity, you’ll need paper (card stock or cardboard), scissors, glitter glue, and supplies for coloring and decorating: permanent markers, washi tape, watercolor paints, tempera, oil pastels, etc. This activity is especially good for families with small children where each of you can create several trees with different designs. An added benefit, the trees you make for this matching game can also be used to decorate your home, or even to use on Christmas-themed hats! We’re sure there are more uses for these trees; let us know if you come up with some! 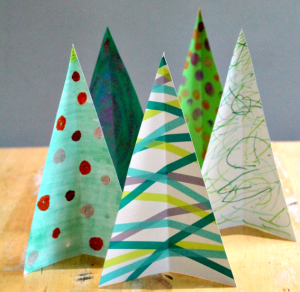 To make the trees, start by drawing a simple triangle on a piece of card stock or cardboard. Make sure to let your children do this – the shape doesn’t have to be perfect! Let them experiment with colors and materials you have prepared so that they create their own designs. Glitter glue, tempera, and the other materials are best applied by hand. Don’t worry about dirty hands – children love sensory activities – not to mention a little bit of mess! For the matching game – simply cut several trees in half and lay all the pieces out, in a jumbled arrangement. Ask a child to find each of the matching pairs. This is a good activity for toddlers to look carefully and spot similarities and differences. This activity is good for developing balance, motor skills, coordination, and the core strength of your kids. Even more importantly, it is easy to set up! You will need green painter’s tape, paper or yarn-wrapped ornaments (you can make them easily during preparation activities), and a paper star. 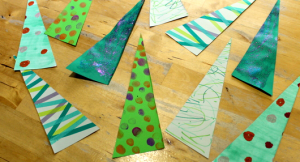 First, create a large Christmas tree on the floor in an open space, using the painter’s tape. Place the ornaments in a pile at the bottom of the tree and create the rules for the game. It’s more fun if you are part of the game and if there is more than one child participating since it is a good opportunity to practice teamwork. It’s easiest if you have the kids take turns squatting or bending to pick up an ornament and then walking along the trunk and branches of the tree (being sure to keep their balance!) until they find the spot they want to decorate. You can always add or change instructions depending on your kids’ ages and to keep them focused. For this activity, you only need construction paper and glue sticks. It’s ideal for toddlers and younger kids since you don’t need scissors and they’ll love the paper tearing! And, they’ll get to practice their fine motor skills. Of course, older children and parents can have fun as well with this creative activity! Nowadays, making family photos is easier than ever. However, you can make it even more fun by adding some acting and hand-made details to the process. Also, don’t discount the old-school value of depicting your family through drawings since this nurtures our imaginations and subjective perceptions of each other. No ordinary Christmas photo shoot! Forget about posing! Why not make funny facial expressions with hand-made Christmas symbols instead? For this very important family photo shoot, you’ll have to make some preparations. Prior to the shoot, organize a workshop to create the props that you will use. You’ll need cardboard, scissors, markers, tape or glue, glitter, and sticks. You can always add other material for even more decoration ideas – be creative! 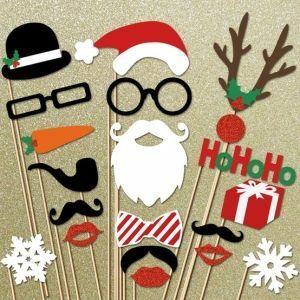 With the children, make some Christmas symbols from the cardboard such as reindeer horns, Santa’s hat, Rudolph’s nose, Santa’s beard, a snowflake, etc. After you have created your decoration, attach a stick to each item. You can also create some colorful and shiny Christmas glasses to wear too! Now, you’re ready and the photo shoot can begin! During the shoot, you can change props and even change who takes the photos. Also, you can add improvisation and acting games for making even more funny poses and facial expressions such as: Santa needs to go to the bathroom! Or, happy snowflake! And, with the glasses, you can coolly pose as Johnny Depp (or any other celebrity/character everybody is familiar with). As your imagination unfurls, so too will other ideas for even more creative photos. Don’t forget to tell us how your photo shoot went, and send us some photos, of course! In this family workshop, you’ll need paper and pens for each member of the family. Of course, you’ll probably want to add markers and some crayons too, for added color. First, everyone should draw the family as they see it. Make sure to leave space in the upper part of the paper so that you can draw a speech bubble above each member of your family. 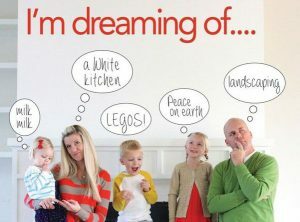 Once you have everyone drawn, add the words ‘I’m dreaming of…’ at the top of the paper. Then, fill the bubbles with the rest of the words – but before you do, you’ll have to put yourself in the shoes of your loved ones. This is a good psychological exercise to be done with teenagers and even with your partner. It’ll be interesting when you compare your answers. In this fast-paced life, sometimes we lose sight of the needs of our growing children or even the changing needs of our partners, and we consequently disconnect. For younger children who haven’t yet learned to write, you can have them draw symbols within the speech bubbles instead of words. Whatever you decide for your theme, don’t forget to share what each of you has added, and to discuss it. You might just discover important insights and share some experiences that help you understand your family even better! Check out the second part of our holiday ideas here!